Q. What sort of people does God use to accomplish His work? A. Not the sort you might expect. 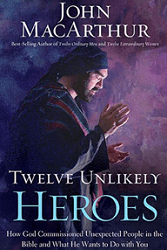 In Twelve Unlikely Heroes, John MacArthur takes us on a tour of biblical history, showing us a dozen ordinary men and women who were used by God for extraordinary things. These people were not flawless; to the contrary, they were unsettlingly real. They stumbled, doubted, and fell. Some of them were pretty messed up. But God’s strength “is made perfect in weakness” (2 Cor. 12:9) – and He worked through these men and women in astonishing ways despite their shortcomings. Before I write any further, though, I have a confession to make: this is the very first MacArthur book I’ve ever read. No joke. Several of them are on my reading list – Slave, in particular, is one I’d like to get my hands on – but Twelve Unlikely Heroes was the first to land on my shelf. Thankfully, I think it proved to be an excellent starting point for a MacArthur-rookie like myself. His writing is simple (though far from simplistic) and engagingly conversational; and he does a smashing job of showing how the stories of these “heroes of the faith” apply to believers today. Some of the heroes covered in the book are ones which we generally don’t think of: Enoch, for example; or Jonathan; or Moses’ sister Miriam, dubbed “the leading lady of the Exodus.” But as MacArthur digs deeper into their lives, it becomes plain that their inclusion was well-merited. It is imperative to emphasize one critical point: the true hero of Scripture, in every Bible story, is God Himself. A quick review of several classic Sunday school stories immediately illustrates this point. Noah did not preserve the ark in the midst of the flood; Abraham did not make himself the father of a great nation; Joshua did not cause the walls of Jericho to fall down; and David did not defeat Goliath on his own. In each of those well-known examples, and in every other case, the Hero behind the heroes is always the Lord. Needless to say, I loved this book. 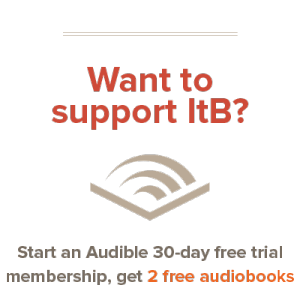 I think you will, too. Consider that a recommendation, find yourself a copy to read.